Discussion in 'Skins' started by CuvisTheConqueror, Jan 28, 2012. I know the replacement for the Spin Slash looks kind of weird, but I couldn't figure out what else to do with it. And the Batman game doesn't really have a lot of power-up icons to work with. I think I'll revisit this one. EDIT - New version. Used graphics from Batman: Return of the Joker for the remaining weapons. And I decided what to do about the power-up icons; I just made new ones in Ninja Gaiden style for the Bat-weapons. CowboyJoseph64, SubZeroHayabusa90, JoMamma and 9 others like this. Damn, that Batman skin looks awesome. Even though I am against characters who didn't originate from video games being in the game, I'm fine with skins of them, but DAMN. That looks great. TheomanZero and Mitewing like this. Good job! Great to see Ryu get some attention. Batman is a great choice. The character from Kabuki Quantum Fighter plays like a cross between Ryu and Batman. I think he'd make another good skin as well. Check out the game at www.virtualnes.com. Finished my Espio Skin for Ryu! I know it's not perfect cause I use www.iaza.com to make this Transparent. BassWins(YayRandomName) and nickreaper like this. Cool skin. Can Espio climb walls? I would think Knuckles would be more appropriate. Also, about Batman. I'd love to see him recolored to black and gold to look more like the movie itself. Actually,in Knuckles Chaotix,Espio CAN go in Walls which did inspire me. Espio can also climb CEILINGS! Knuckles wouldn't be as appropriate because the reason I chose Espio is because he is a Ninja,and so is Ryu,so it would be EASY to make. I am currently gonna do a possible project to do Sonic Characters as SMBC Characters. That looks really nice! I have one suggestion, though. The spinning sword jump should probably be just the normal purple sphere jump, rather than a mid-air spin-dash. Eh,didn't think of anything else so I just made it a Spindash so it can differ from the Jump. → That's great! It looks quite accurate! 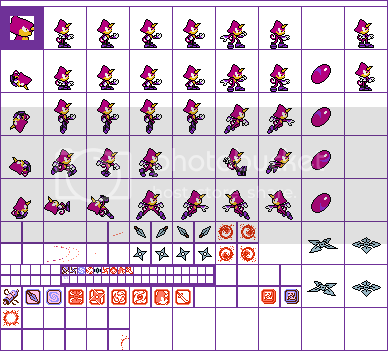 I suggest making custom sprites to replace Spinslash sprites. Did you have a particular motion in mind? I kind of drew a blank, which is why I did that weird chop thing. → Well, like, Batman kind of croweling himself... a bit like Ryu in fact. But with his cape cloating. But I guess Batman would be weird looking wit such an agility so I may give a bit more thought about it. I'd recommend looking at sprites from the other two NES Batman games for ideas. Grant Dynasty from Castlevania III. Somebody did suggest this once on another Fourm so I decided to make it because nobody else did. For once making a Skin well worth it and it MAY get added to SMBC. I know for sure because,well,I simply do. nickreaper and Mitewing like this. Grant Dynasty from Castlevania III. → What may be wrong: Hitbox, attack box, how weapons and attacks will look. Mostly that. 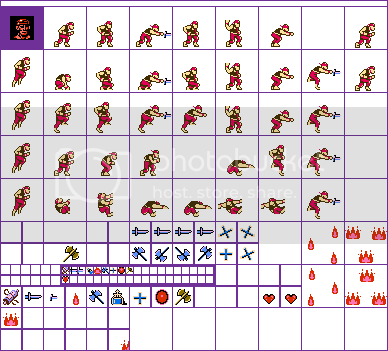 "How weapons and attacks will look" includes a lot of problems will sprites replacements. Yeeeeeeeahhhhhhhh,not really known on the whole replacing Ryu's Weapons things sorry about thaaat. If ya wanna fix it,please,and plus I think Jay may edit Grant to control slightly different from Ryu,like Protoman will be compared to Megaman (Protoman is supposed to shoot lower,Jay was able to do so). → I don't know either, but replacing windmill shuriken by cross would make a bit more sense, for example. About his saber, it's way longer than Grant's broken knife, so there's nothing that can be done, I guess. I'm not sure Jay will really do much work just to include Grant. How many weapons does Grant have access to in Castlevania 3 and what are they? Just the Knife and the Axe, I'm afraid.